What an amazing AND most scary experience. With the honour of representing our country, Elmien , Heilethe and I entered the Portuguese hall in Johannesburg with mixed emotions. Elmien was the more “relaxed” one as she had done this before, but the same could not be said for the rest of us. Thursday we spent about 4 hours at the hall for weigh in and team speeches’ by Sensei Ian le Roux. We got to meet our coaches and did roll call. Friday met us with some nerves as we spent the day supporting our team and seeing the other countries’ karatekas for the first time. Botswana entered with good spirit. Namibia, Zimbabwe and Mozambique were there as well. 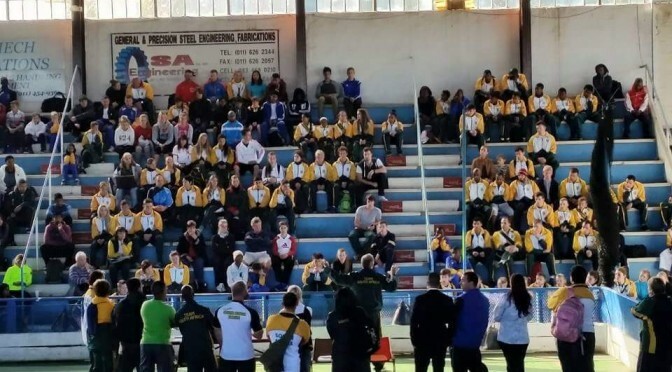 All the children, juniors and cadets competed that day and the quality was of an incredibly higher standard than what we are used to seeing on regional’s and provincials…..even nationals. I could not believe the speed that the katas were performed with. Absolutely amazing! Then Saturday hit us and the butterflies became dragons. Fire breathing, evil, HUGE dragons. As we arrived we were told all veterans (that’s me and Heilethe) were on first. We had hardly time to defrost as we reported to our floors and did our stuff. As most competitors feel after an event like this, it was with mixed emotions – a feeling one could have done better and a feeling of pride as we know we did our best at the time, and we did something we never thought we would ever do…REPRESENT OUR COUNTRY..and also..REPRESENT OUR CLUB, which is probably the one thing one feels the most proud about. The standard I saw on that tournament made me even more determined to improve on my karate and also showed me I still have a very long road to go as far as my own standard is concerned. It also showed me that our club can definitely compare to the best in SA as our Sensei definitely knows his karate as he was one of the coaches for the children/cadet and junior team and many turned to him for advice. It made me very proud to tell other karatekas I belong to Solis Ortus, and Sensei Eugene Oosthuizen, a name many recognised, was MY Sensei.